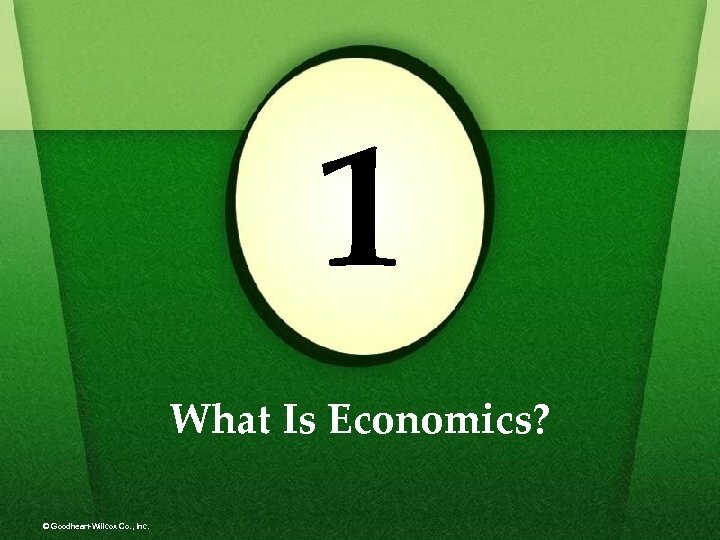 © Goodheart-Willcox Co. , Inc.
1 What Is Economics? 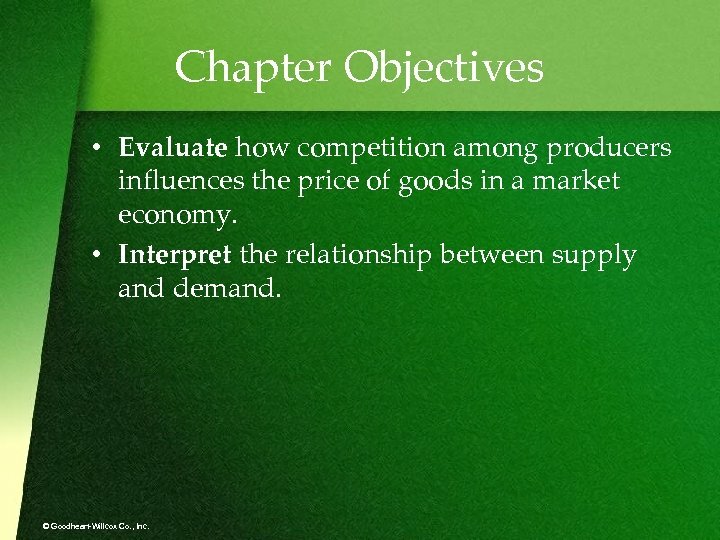 © Goodheart-Willcox Co. , Inc.
Chapter Objectives • Evaluate how competition among producers influences the price of goods in a market economy. 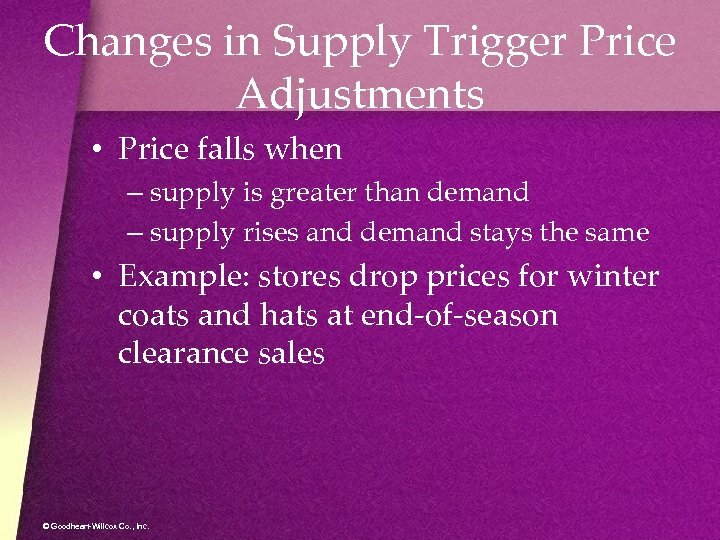 • Interpret the relationship between supply and demand. 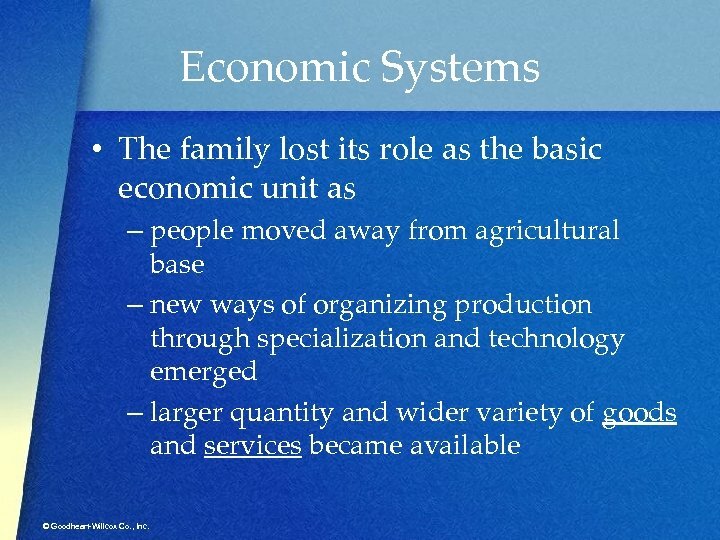 © Goodheart-Willcox Co. , Inc.
Economic Systems • The family lost its role as the basic economic unit as – people moved away from agricultural base – new ways of organizing production through specialization and technology emerged – larger quantity and wider variety of goods and services became available © Goodheart-Willcox Co. , Inc.
Types of Economic Systems • Four types of economic systems: – Traditional – Market or free enterprise – Command – Mixed © Goodheart-Willcox Co. , Inc. Traditional Economy • Found mostly in underdeveloped countries • Change comes slowly • People tend to stick with what they know and do as they always did • People are governed by strong cultural, religious, or tribal leadership © Goodheart-Willcox Co. , Inc.
Market Economy • Examples: – Market for all goods and services in an economy – Market for cars – Market for a certain brand of sneakers © Goodheart-Willcox Co. , Inc.
Command Economy • Commonly found in socialist and communist countries • A central authority, usually government, – decides how resources are allocated – decides who will produce what – sets prices and decides how much to produce © Goodheart-Willcox Co. , Inc. 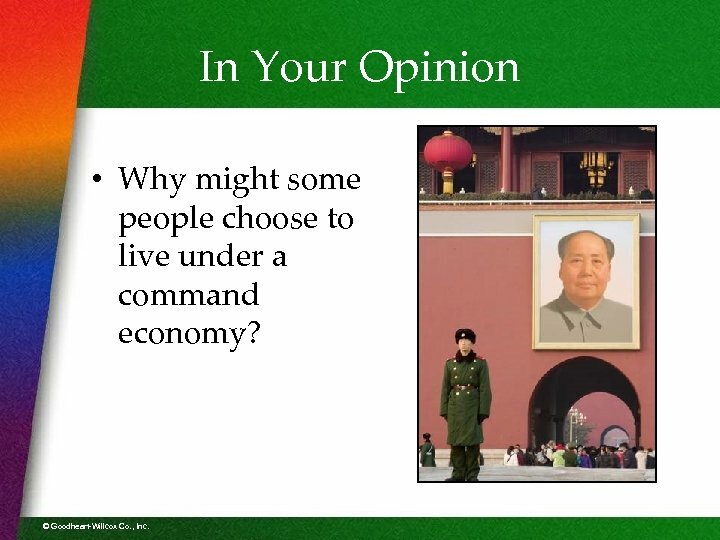 In Your Opinion • Why might some people choose to live under a command economy? © Goodheart-Willcox Co. , Inc.
Mixed Economy • Combines features of command market economies • Exists in the U. S. , China, Great Britain, Japan, and many other nations • Most economies are mixed • Though mixed, the U. S. economy has minimal government involvement © Goodheart-Willcox Co. , Inc. 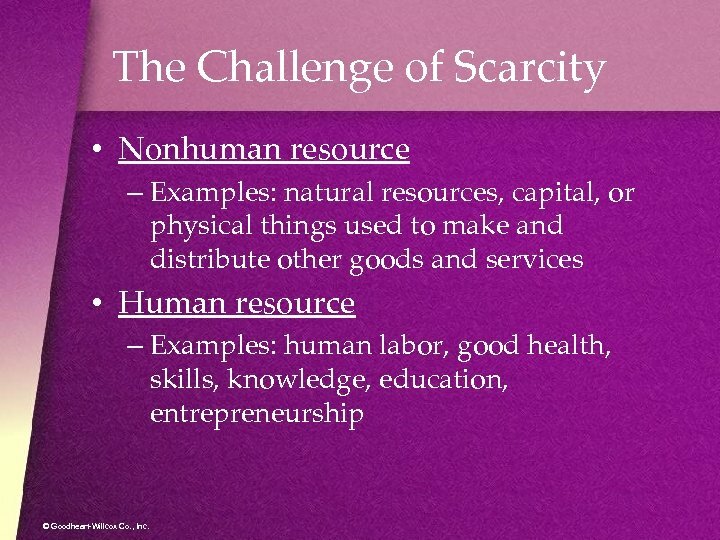 The Challenge of Scarcity • Nonhuman resource – Examples: natural resources, capital, or physical things used to make and distribute other goods and services • Human resource – Examples: human labor, good health, skills, knowledge, education, entrepreneurship © Goodheart-Willcox Co. , Inc.
Trade-Offs and Opportunity Cost • Scarcity forces everyone to make choices, which involve – trade-offs – opportunity costs © Goodheart-Willcox Co. , Inc.
Scarcity and Economic Systems • Three problems for all societies: – What and how much to produce – How to allocate resources in producing goods and services – How to divide the goods and services produced © Goodheart-Willcox Co. , Inc.
How the U. S. Economy Works • Flows of payments for goods, services, and resources between consumers/workers and producers/sellers © Goodheart-Willcox Co. , Inc.
Four Qualities of a Market Economy • Private ownership and control of productive resources • Profit motive • Free economic choice • Competition © Goodheart-Willcox Co. , Inc. 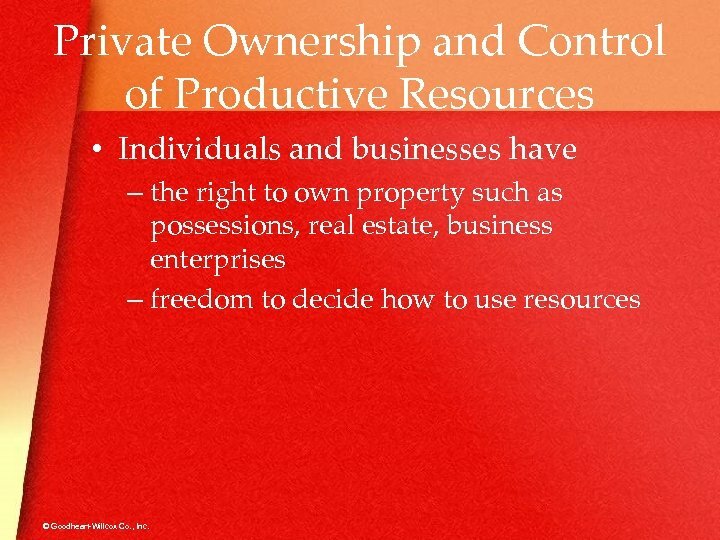 Private Ownership and Control of Productive Resources • Individuals and businesses have – the right to own property such as possessions, real estate, business enterprises – freedom to decide how to use resources © Goodheart-Willcox Co. , Inc.
Profit Motive • Provides incentives for – entrepreneurs to take risks to start new businesses – businesses to produce goods and services – investors to buy stocks, bonds, and other investments – people to sell their resources: labor, land, ideas, capital © Goodheart-Willcox Co. , Inc.
Free Economic Choice • Businesses can choose – what they produce – how and where to produce it – how and where to sell what they produce – what to do with their profits © Goodheart-Willcox Co. , Inc.
Competition • Market economies can provide the best products and services at the lowest prices © Goodheart-Willcox Co. , Inc.
• Supply (S) is closely connected to price (P) Supply (S) is how much of something is available (Amount the producer is willing to provide. ) §If you have 9 baseball cards, then your supply (S) of baseball cards is 9. §If you have 6 apples, then your supply (S) of apples is 6. 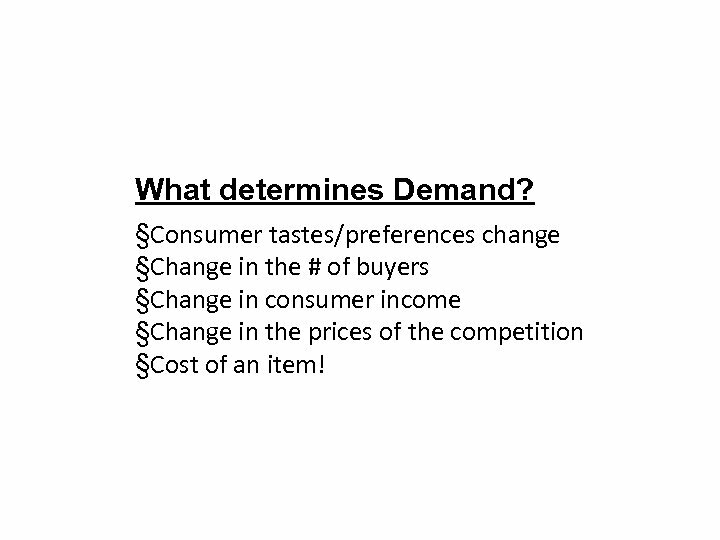 Demand (D) is the quantity of a product that consumers want and are willing to buy. 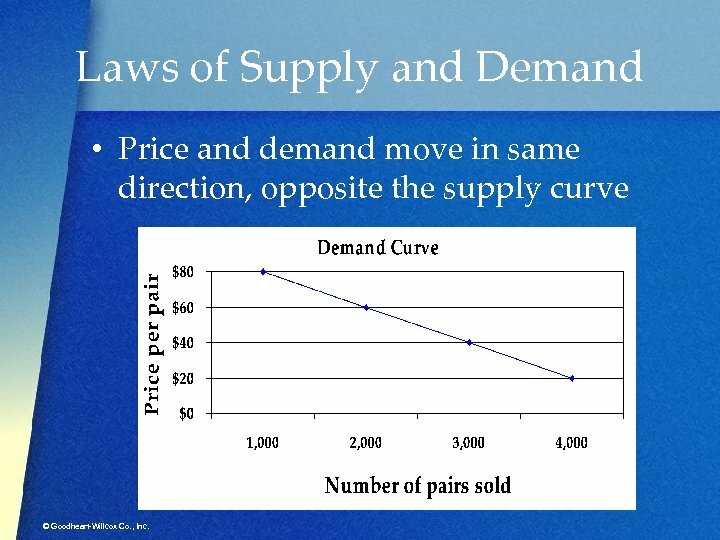 §If 8 people want baseball cards, then we can say that the demand (D) for baseball cards is 8. 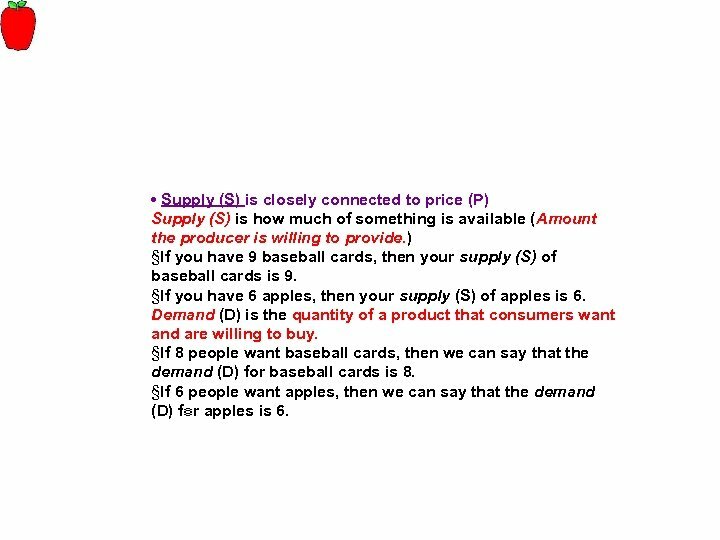 §If 6 people want apples, then we can say that the demand (D) for apples is 6. © Goodheart-Willcox Co. , Inc.
Everybody wants them, and they will be willing to pay more than they normally would to get them. 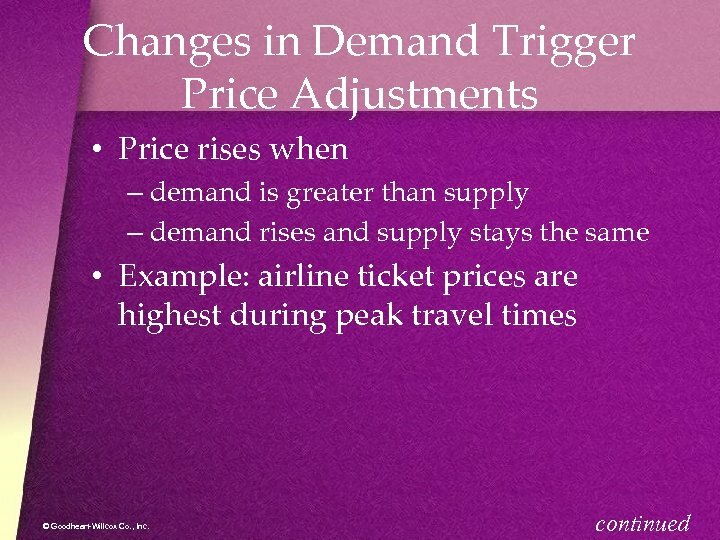 The demand goes up. Why? Because more people want them. The price also goes up. Why? 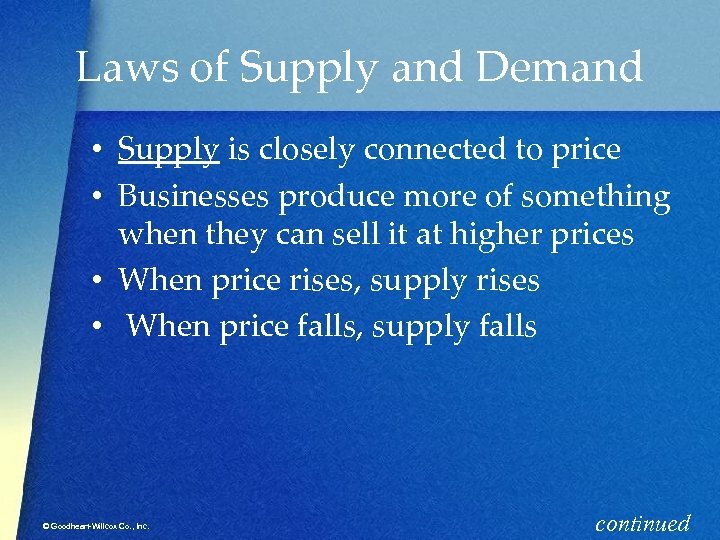 Because the seller knows he or she can get more money for the product because it is in demand. 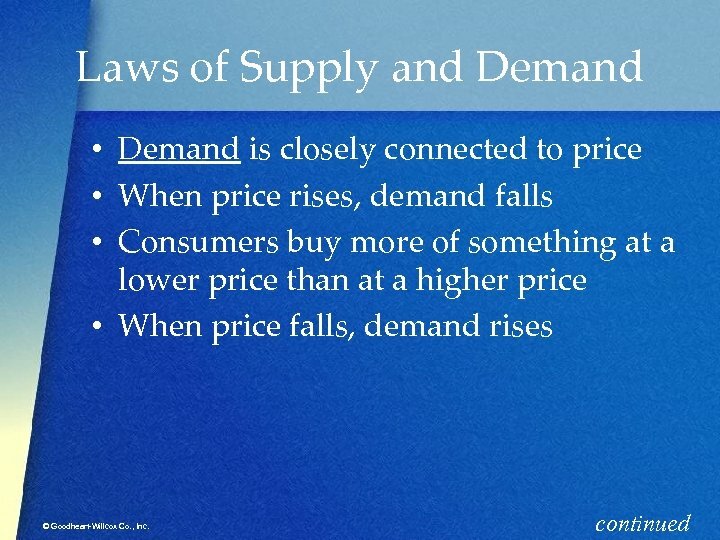 In the same way, the price will go down when the demand goes down. When the new style of basketball shoes comes out, everyone wants the new shoes. The old shoes don't seem so new anymore. The seller still wants to sell those older shoes, since he or she has a lot still in stock. So, the price goes down. Why? 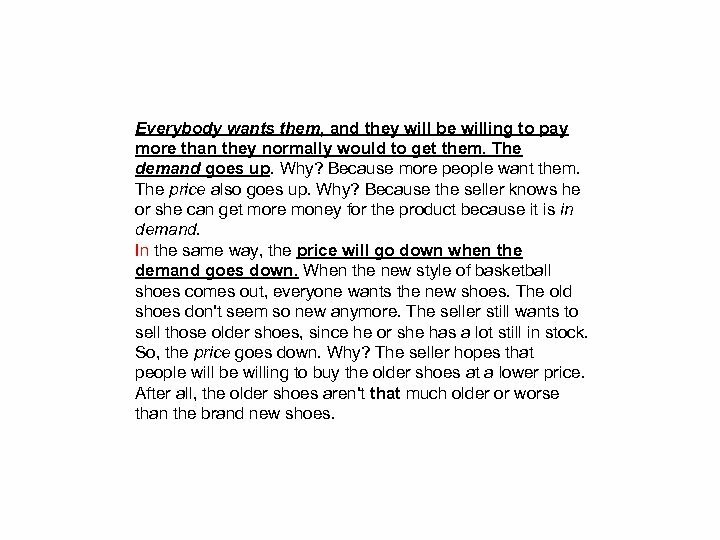 The seller hopes that people will be willing to buy the older shoes at a lower price. 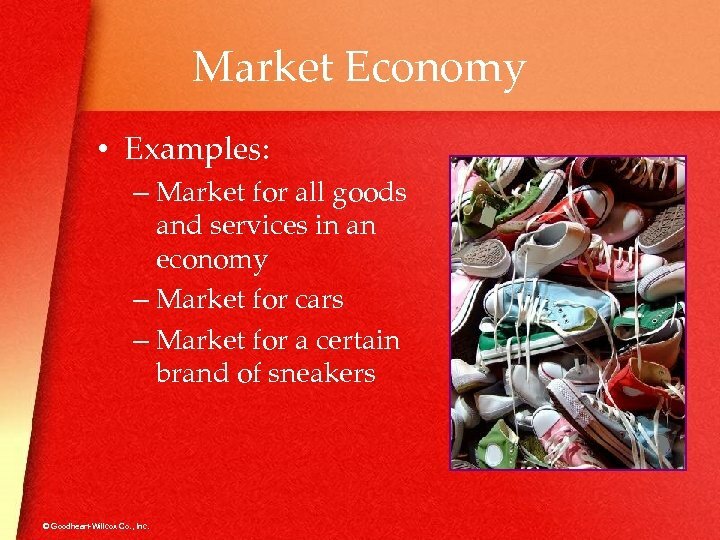 After all, the older shoes aren't that much older or worse than the brand new shoes. © Goodheart-Willcox Co. , Inc.
D up P up D down. 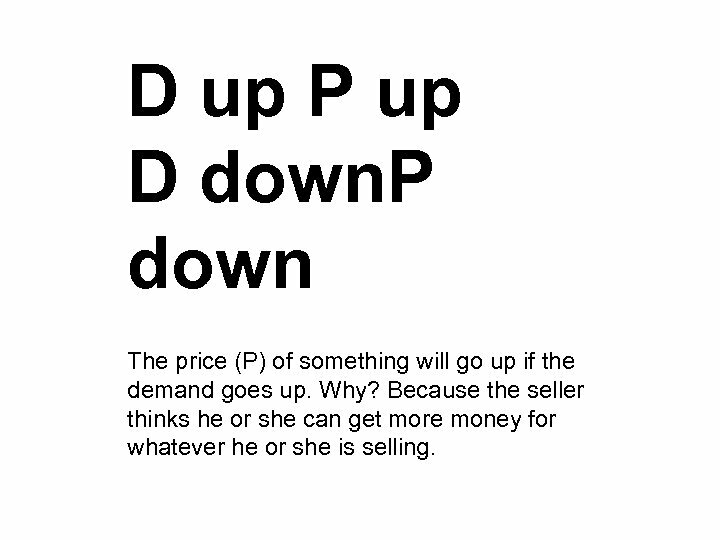 P down The price (P) of something will go up if the demand goes up. Why? Because the seller thinks he or she can get more money for whatever he or she is selling. 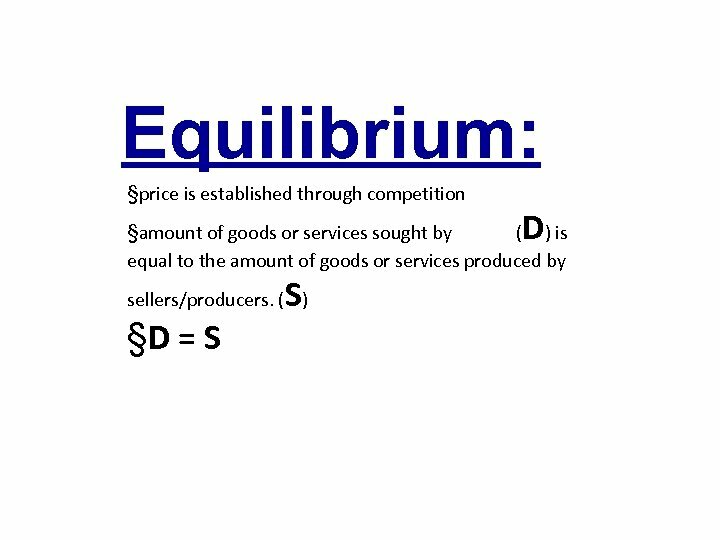 © Goodheart-Willcox Co. , Inc.
Equilibrium: §price is established through competition D §amount of goods or services sought by buyers ( ) is equal to the amount of goods or services produced by S sellers/producers. 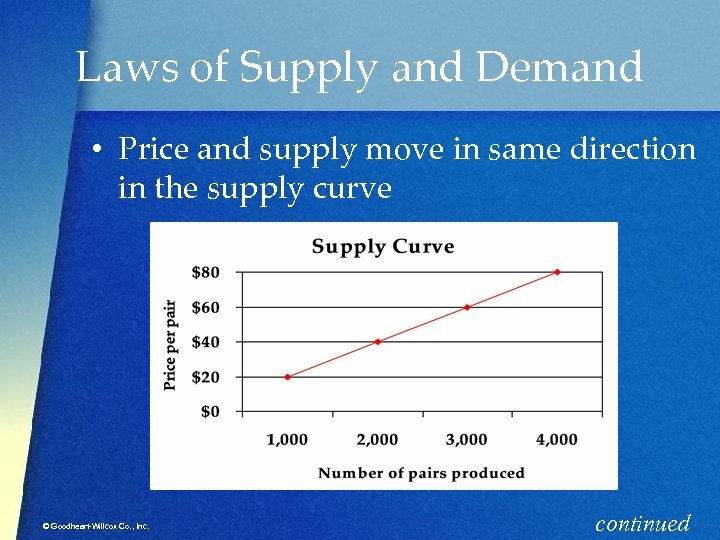 ( ) §D = S © Goodheart-Willcox Co. , Inc.
What determines Demand? 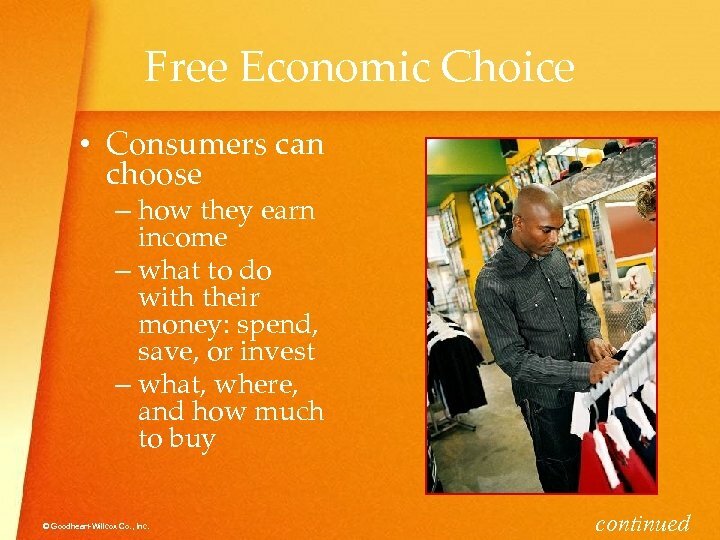 §Consumer tastes/preferences change §Change in the # of buyers §Change in consumer income §Change in the prices of the competition §Cost of an item! 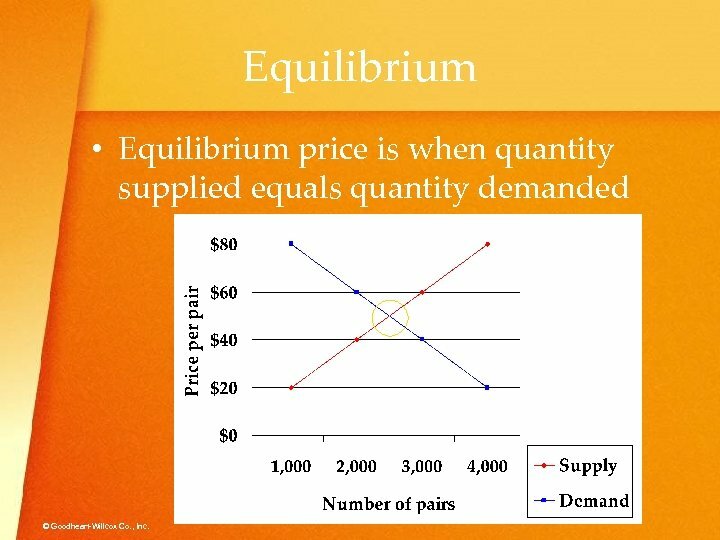 © Goodheart-Willcox Co. , Inc.
Laws of Supply and Demand • Price and demand move in same direction, opposite the supply curve © Goodheart-Willcox Co. , Inc.
Equilibrium • Equilibrium price is when quantity supplied equals quantity demanded © Goodheart-Willcox Co. , Inc.
Changes in Supply Trigger Price Adjustments • Price falls when – supply is greater than demand – supply rises and demand stays the same • Example: stores drop prices for winter coats and hats at end-of-season clearance sales © Goodheart-Willcox Co. , Inc. 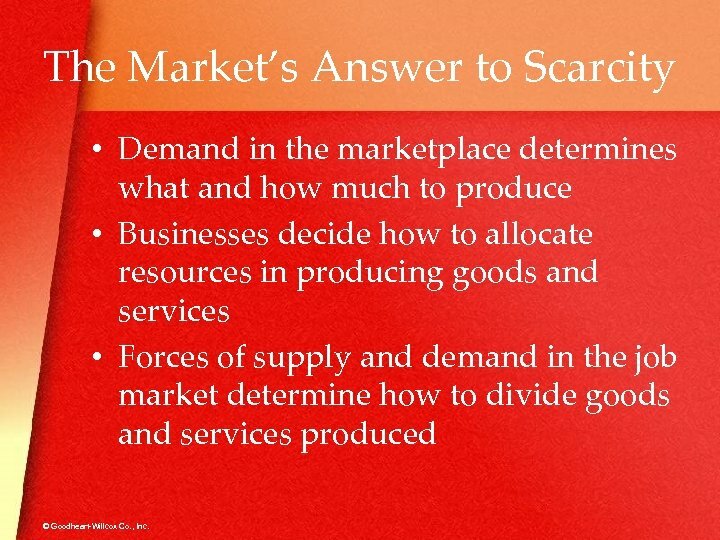 The Market’s Answer to Scarcity • Demand in the marketplace determines what and how much to produce • Businesses decide how to allocate resources in producing goods and services • Forces of supply and demand in the job market determine how to divide goods and services produced © Goodheart-Willcox Co. , Inc. 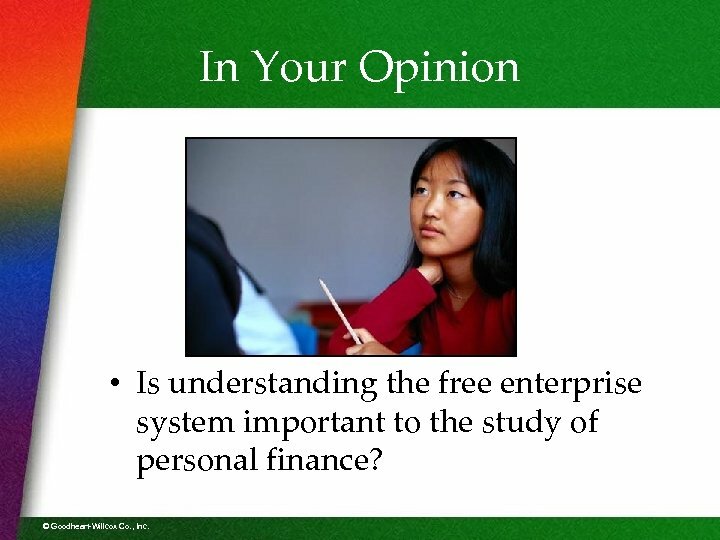 In Your Opinion • Is understanding the free enterprise system important to the study of personal finance? 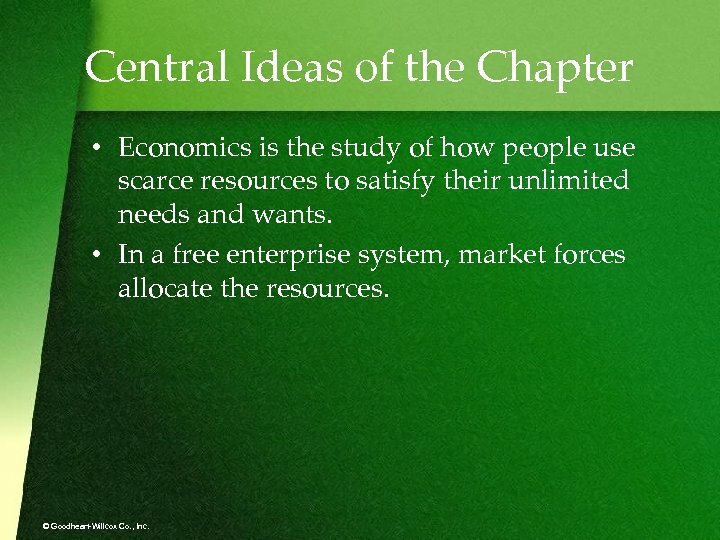 © Goodheart-Willcox Co. , Inc.
Central Ideas of the Chapter • Economics is the study of how people use scarce resources to satisfy their unlimited needs and wants. 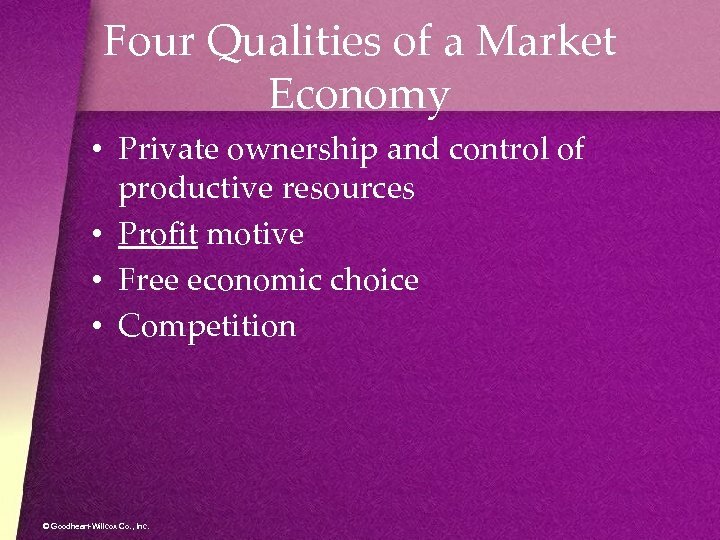 • In a free enterprise system, market forces allocate the resources. 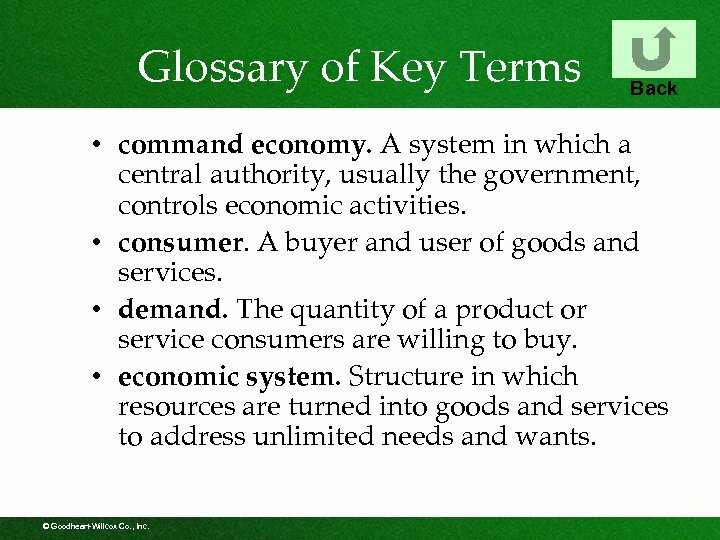 © Goodheart-Willcox Co. , Inc.
Glossary of Key Terms Back • command economy. 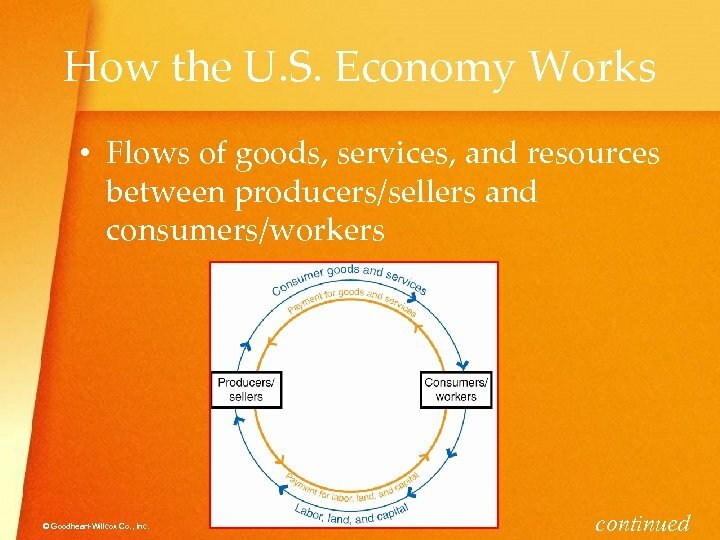 A system in which a central authority, usually the government, controls economic activities. • consumer. 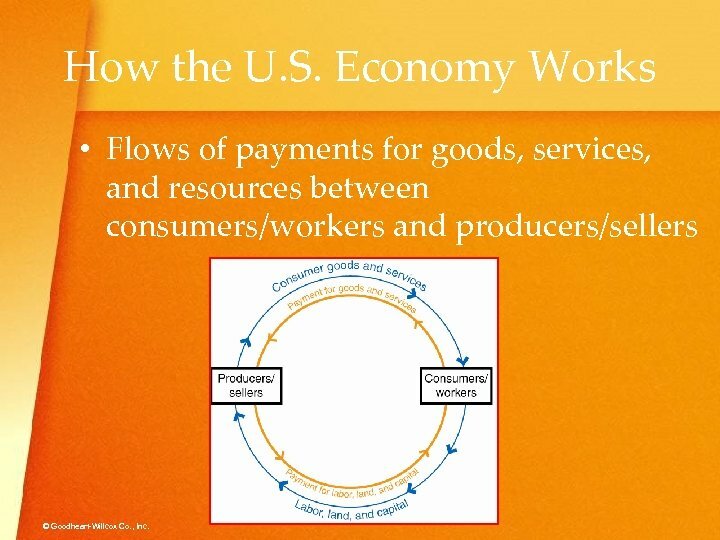 A buyer and user of goods and services. • demand. 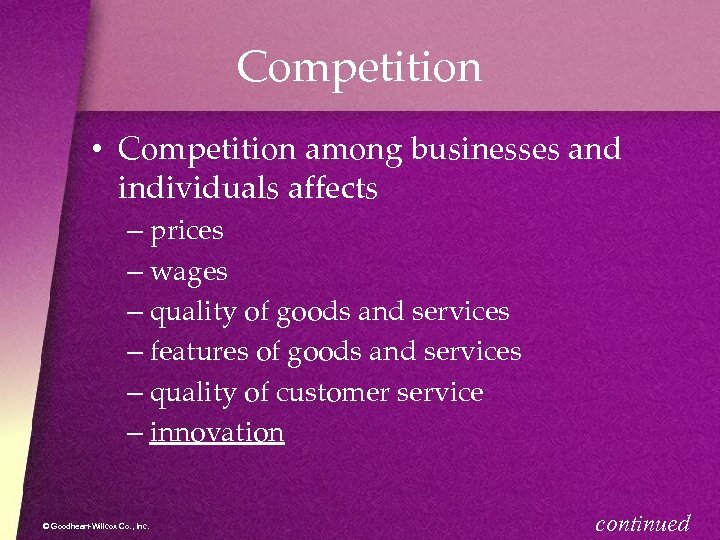 The quantity of a product or service consumers are willing to buy. 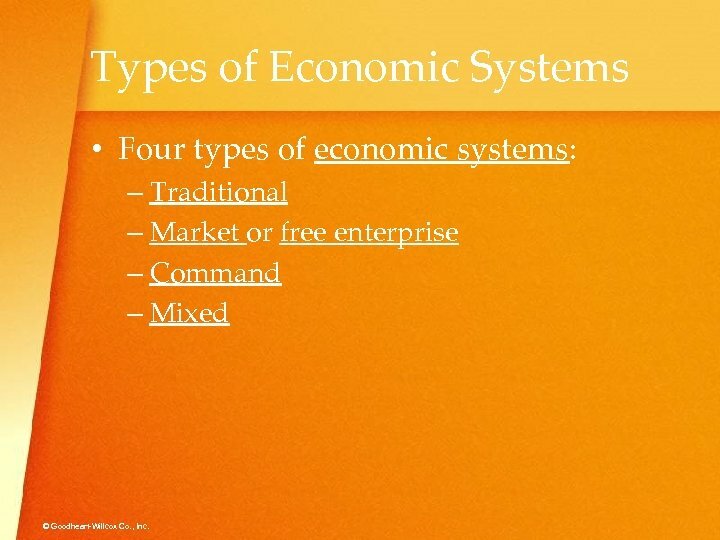 • economic system. 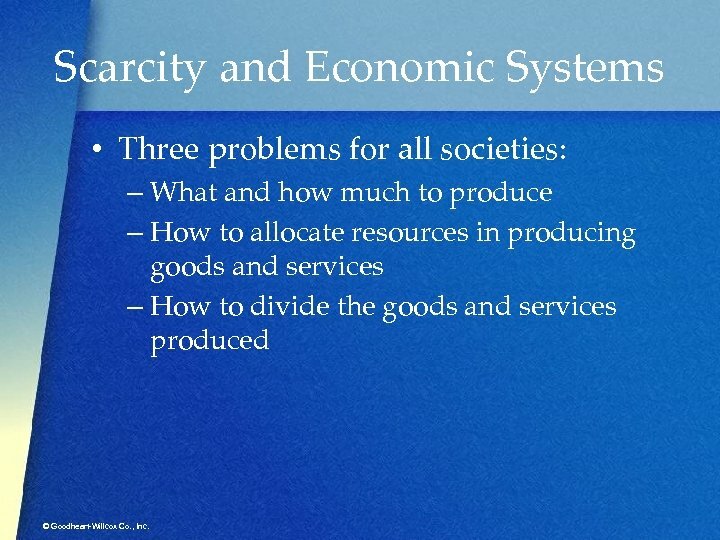 Structure in which resources are turned into goods and services to address unlimited needs and wants. 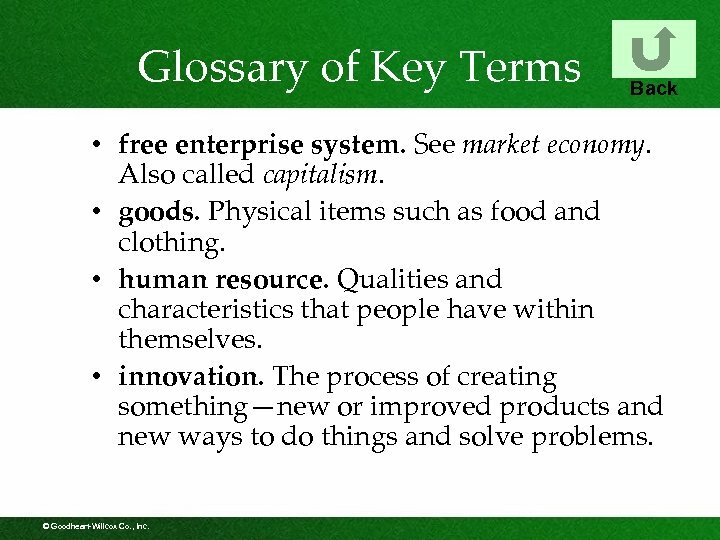 © Goodheart-Willcox Co. , Inc.
Glossary of Key Terms Back • free enterprise system. 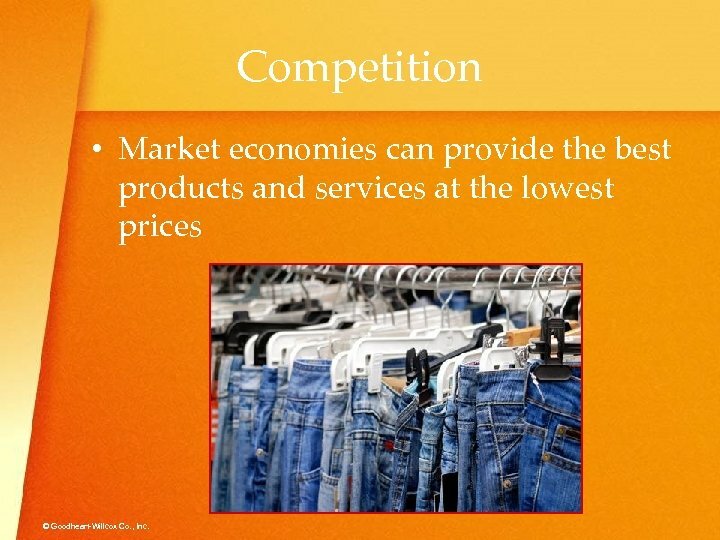 See market economy. Also called capitalism. • goods. 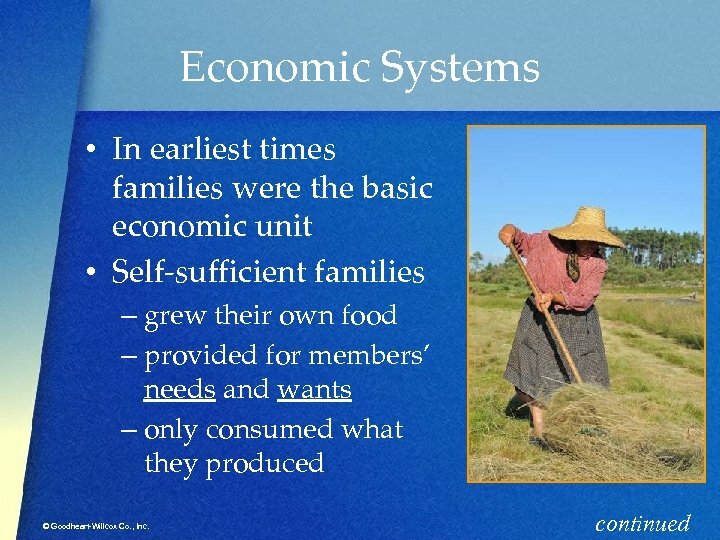 Physical items such as food and clothing. • human resource. Qualities and characteristics that people have within themselves. • innovation. The process of creating something—new or improved products and new ways to do things and solve problems. 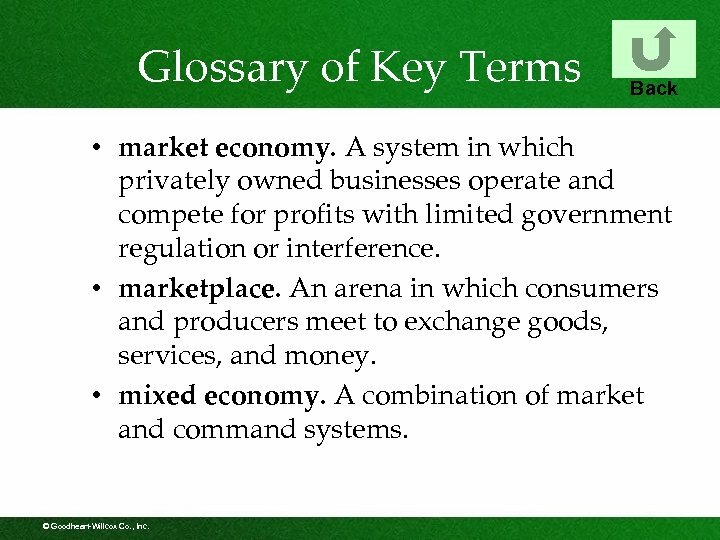 © Goodheart-Willcox Co. , Inc.
Glossary of Key Terms Back • market economy. A system in which privately owned businesses operate and compete for profits with limited government regulation or interference. • marketplace. 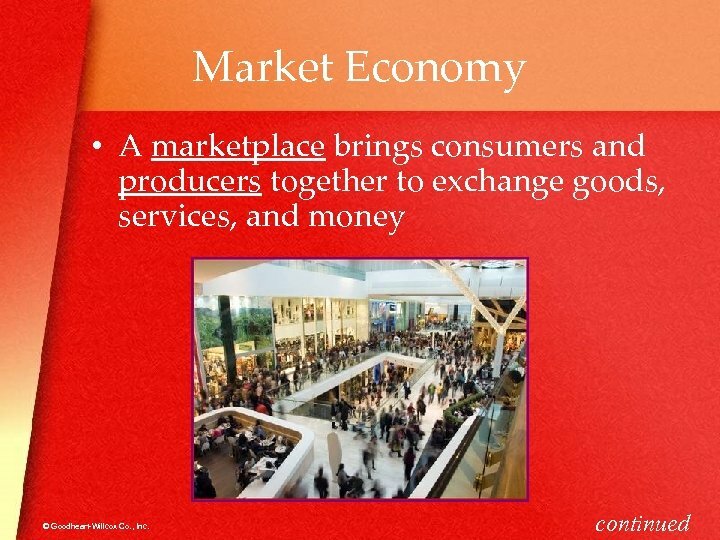 An arena in which consumers and producers meet to exchange goods, services, and money. 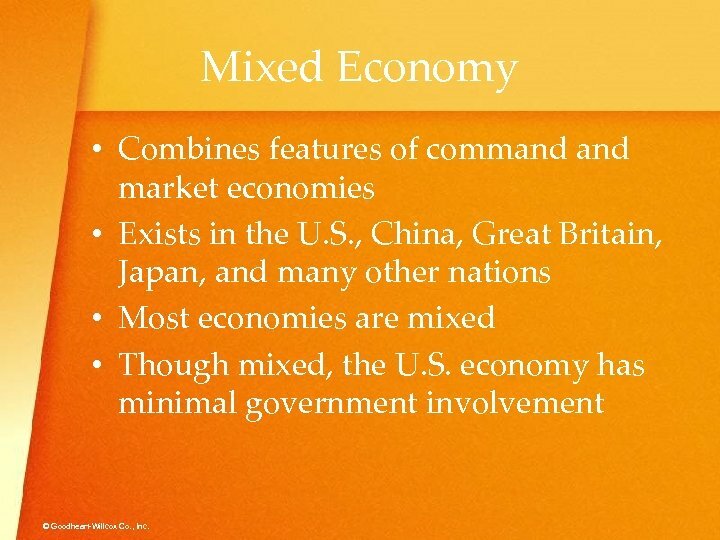 • mixed economy. 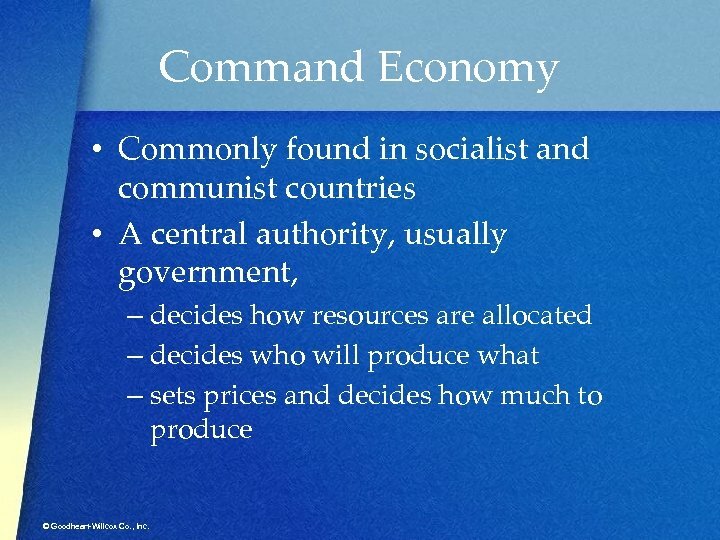 A combination of market and command systems. 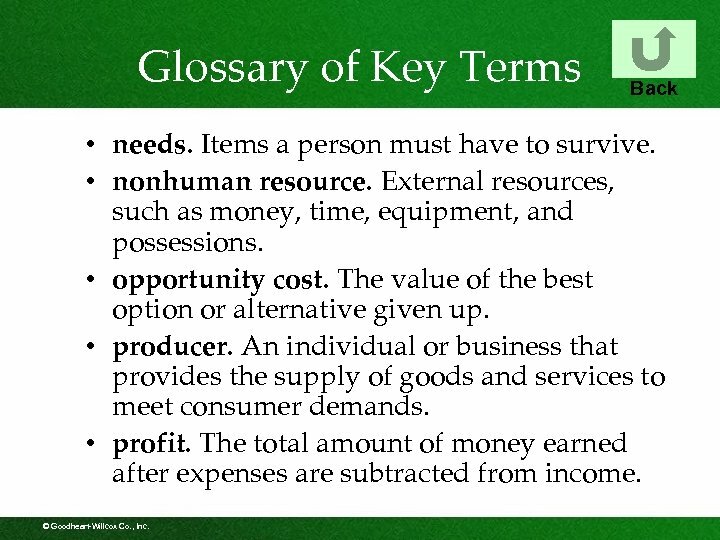 © Goodheart-Willcox Co. , Inc.
Glossary of Key Terms Back • needs. Items a person must have to survive. • nonhuman resource. 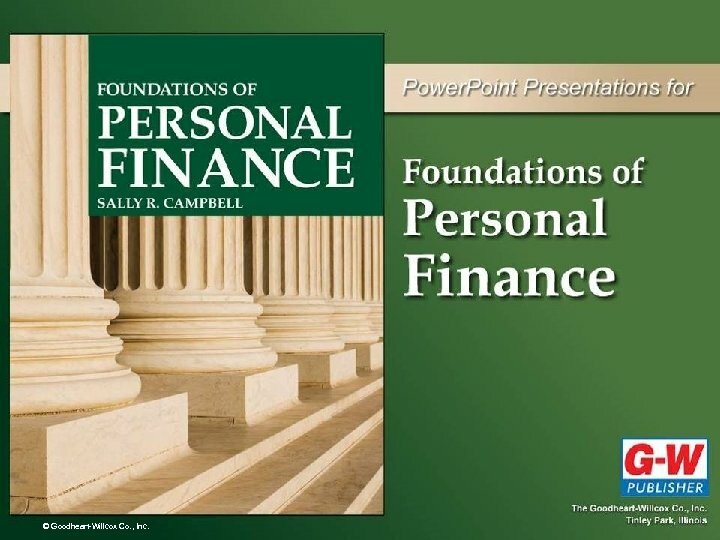 External resources, such as money, time, equipment, and possessions. 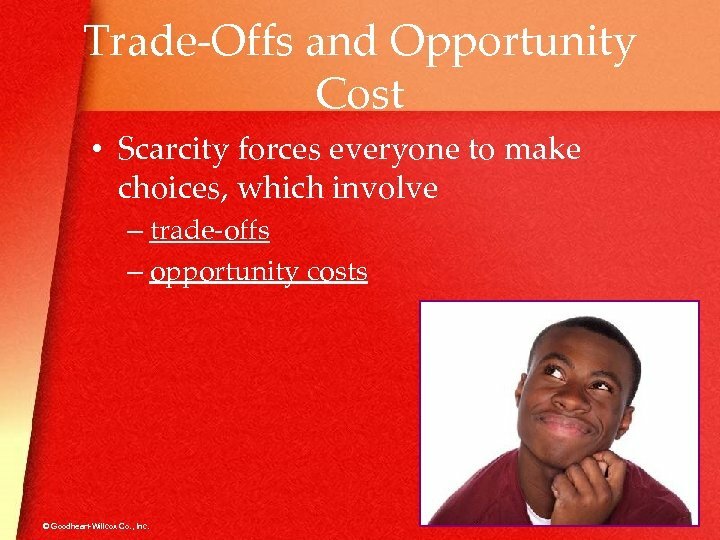 • opportunity cost. The value of the best option or alternative given up. • producer. 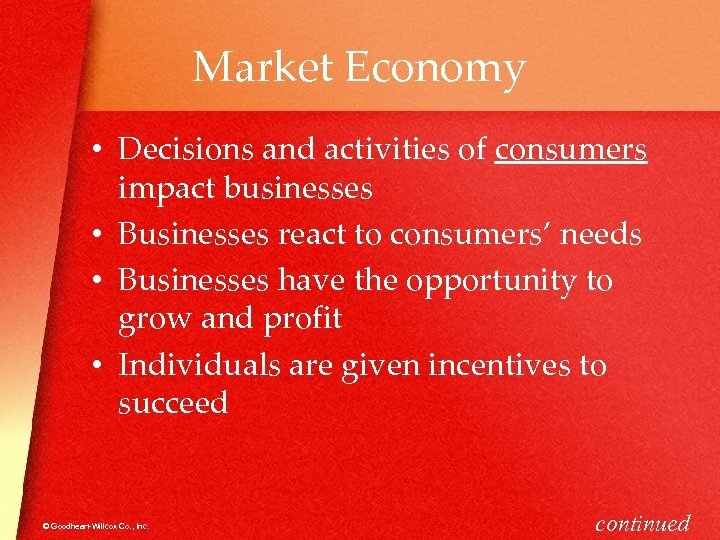 An individual or business that provides the supply of goods and services to meet consumer demands. • profit. The total amount of money earned after expenses are subtracted from income. 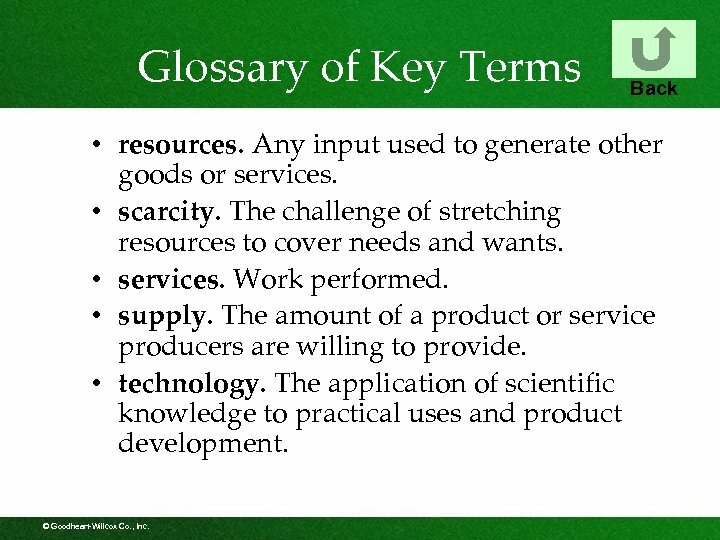 © Goodheart-Willcox Co. , Inc.
Glossary of Key Terms Back • resources. Any input used to generate other goods or services. 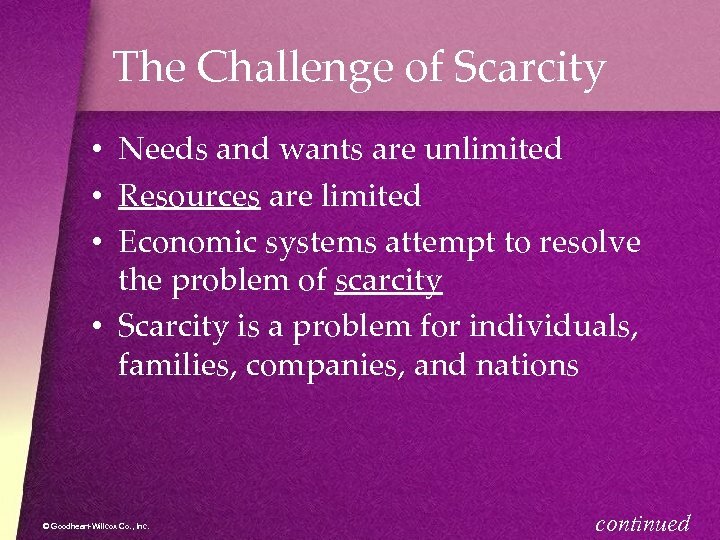 • scarcity. The challenge of stretching resources to cover needs and wants. • services. Work performed. • supply. 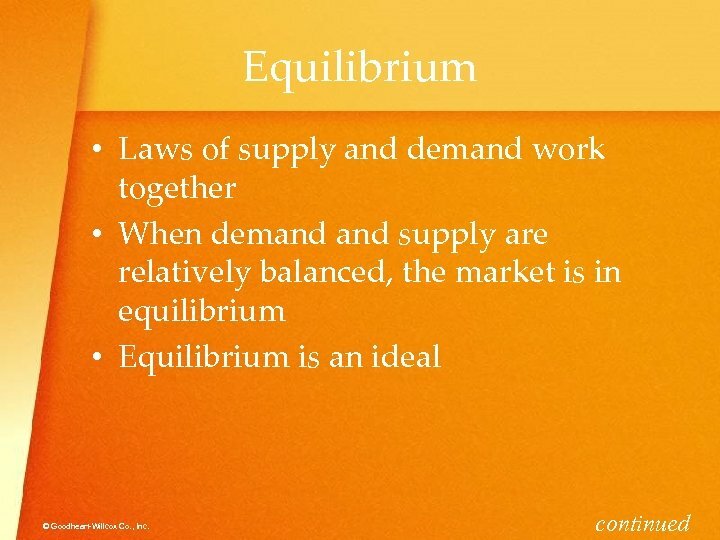 The amount of a product or service producers are willing to provide. • technology. 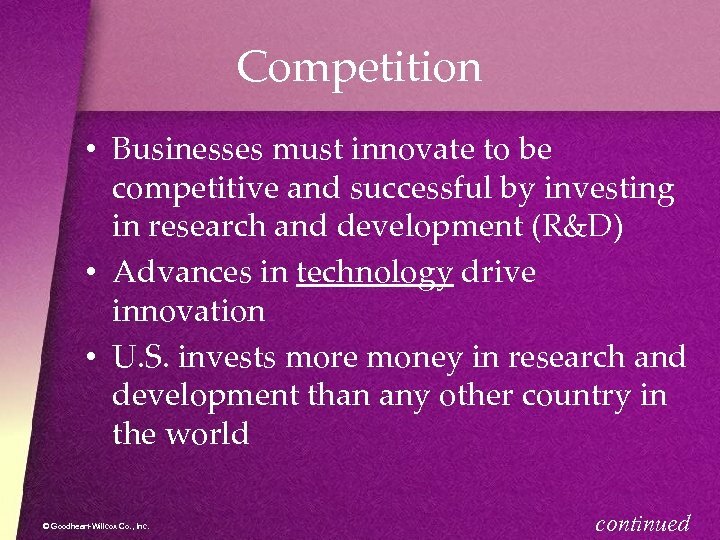 The application of scientific knowledge to practical uses and product development. 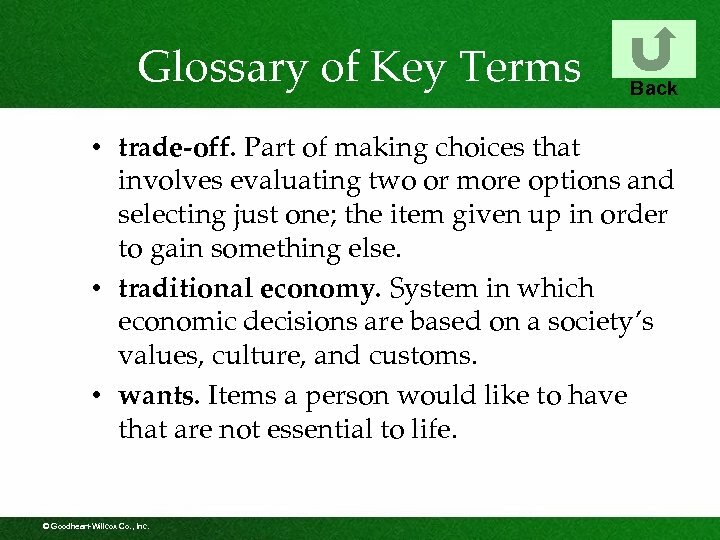 © Goodheart-Willcox Co. , Inc.
Glossary of Key Terms Back • trade-off. Part of making choices that involves evaluating two or more options and selecting just one; the item given up in order to gain something else. 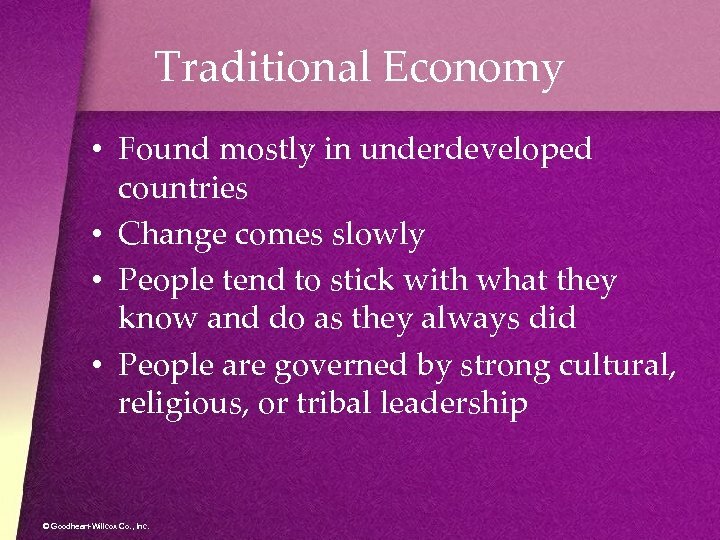 • traditional economy. 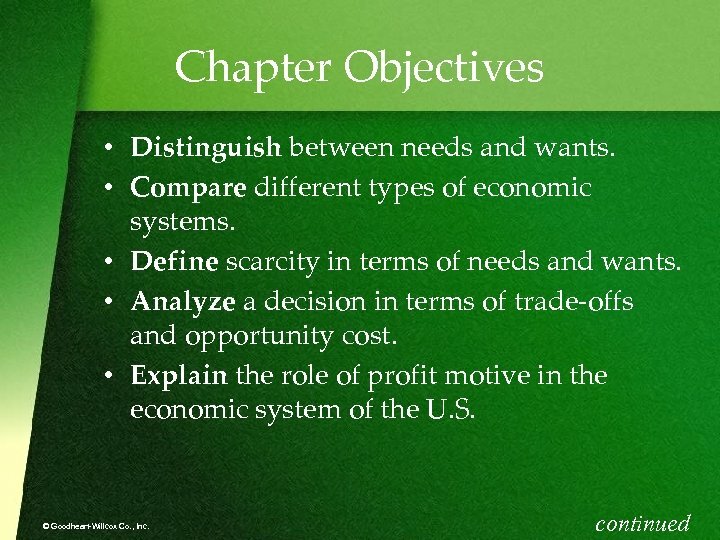 System in which economic decisions are based on a society’s values, culture, and customs. • wants. Items a person would like to have that are not essential to life. © Goodheart-Willcox Co. , Inc.